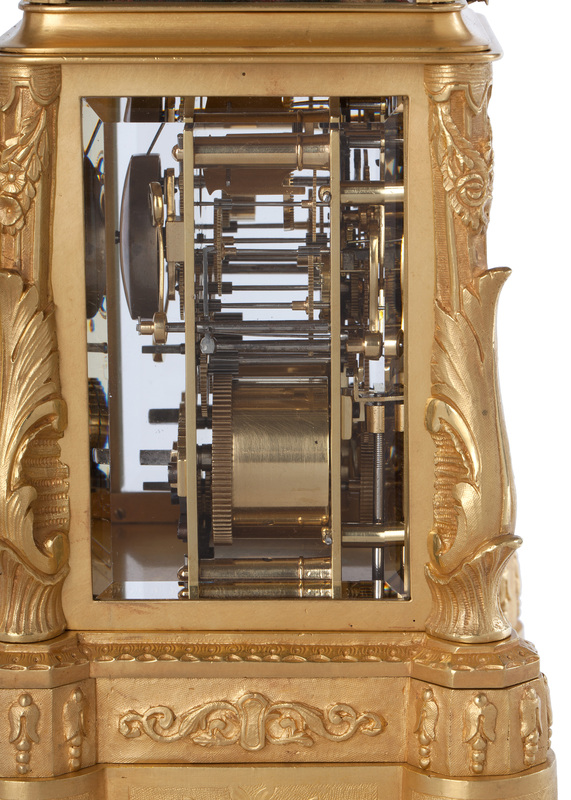 The spring-driven, eight-day movement of this singing-bird carriage clock is constructed between plates. It consists of going and striking trains. The going train has English lever escapement with hairspring balance and regulation. 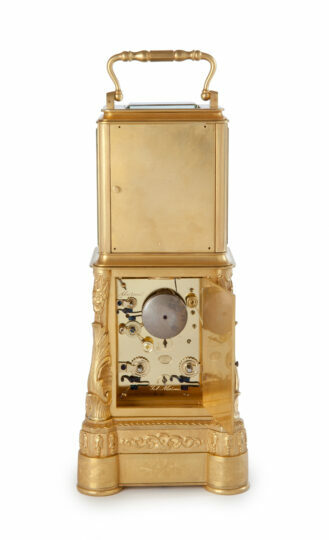 The striking indicates the hour fully and the half hours with a single stroke on a bell. In addition, there is a repeat button on the front, with which the last hour struck can be repeated. 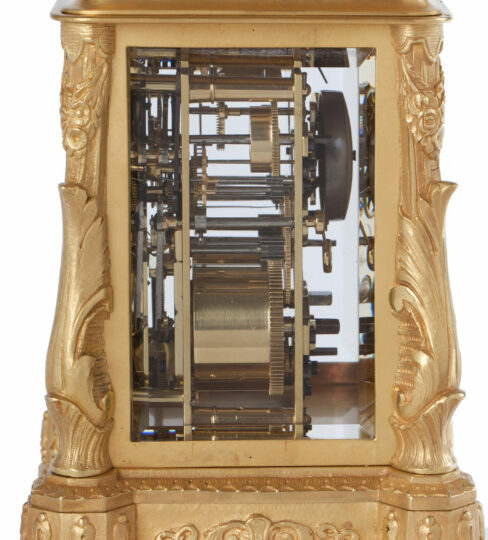 The clock also has an alarm. The bird-cage automaton is activated just before the clock strikes the hour. The bird moves its wings and sings a two-tone song. 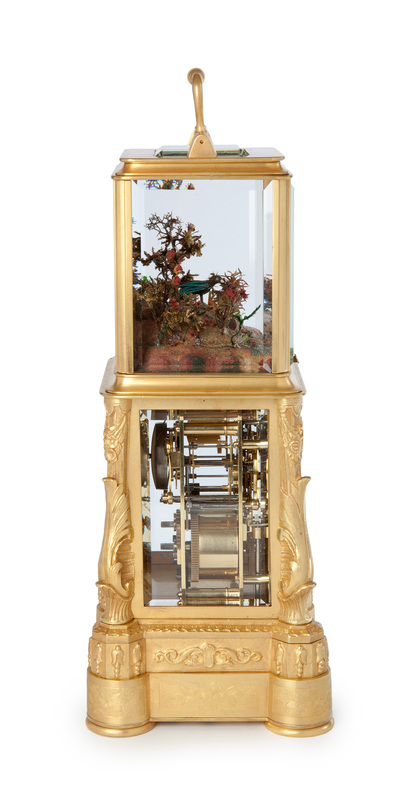 The automaton mechanism is situated in the base and is wound on the side. The clock itself is wound at the back, where there are also the arbors for setting the time and the alarm, the functions of which are indicated in English. 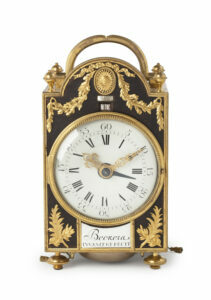 The backplate is stamped by the maker Japy Frères et Cie Exposition 1855, Grande Med. D’Honneur. 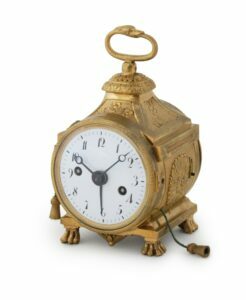 The white enamel dial is set in an engraved gilt-brass mask and has a Roman chapter ring with five-minute and minute divisions. 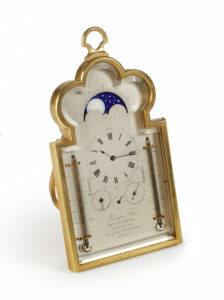 The time is indicated by a pair of finely cut blued-steel Breguet hands. In addition it has a central sweep seconds hand. Below is a subsidiary Arabic alarm dial with a blued-steel hand indicating the alarm time. 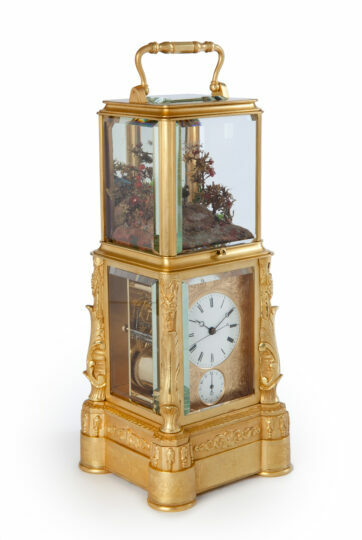 The engraved gilt-brass case of this unusual and rare singing-bird carriage clock has facetted glass windows on all sides so that the movement and the bird automaton are entirely visible. At the back are two doors, the top one having a mirror on the inside so that the bird can been seen very well. 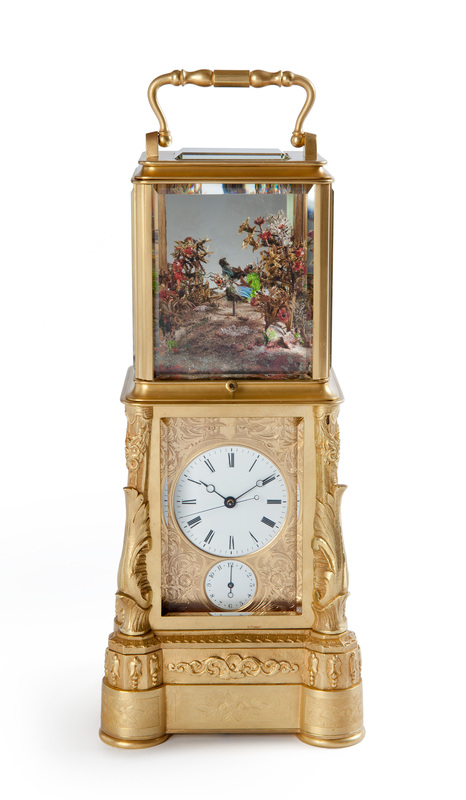 The corners of the case are embellished by acanthus leaf ornaments. 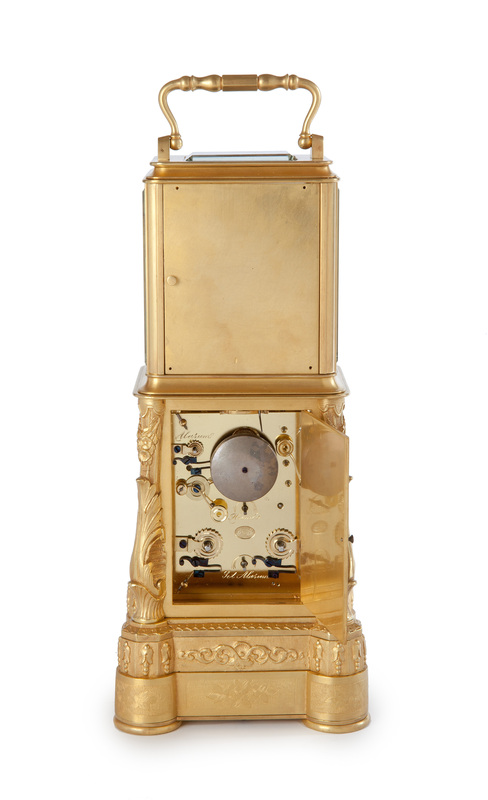 The clock is surmounted by a shaped carrying handle. 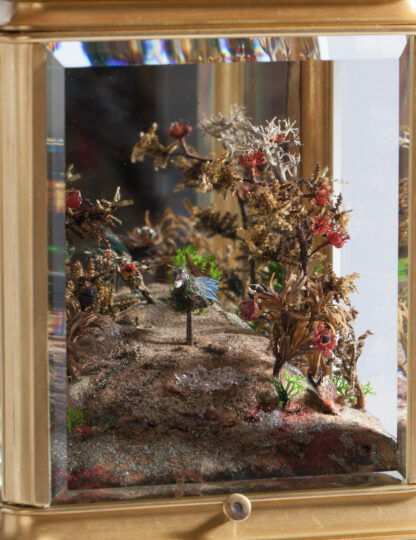 The whole is situated on an embellished and engraved shaped base. Japy Frères et Cie were active in Beaucourt in the French Comté and in Paris around 1850, in the Rue du Temple, 1860, the Rue du Château d’Eau.